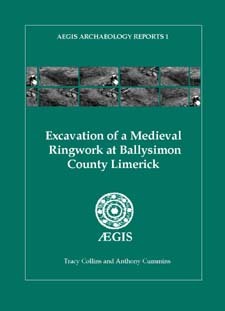 This is the first in-house publication by ÆGIS, which details the excavation of a ringwork in advance of a national roadway project, in county Limerick. It is the first complete ringwork to be excavated in Ireland. It provides a brief background for the monument type (chapter 1), details the excavation (chapter 2), sets the monument in its proper context (chapters 3 and 4) and catalogues the artefacts recovered (chapter 5). A bibliography is provided. The writers are both professional archaeologists with ÆGIS. This publication is sold out. A pdf version is available, please email if required. 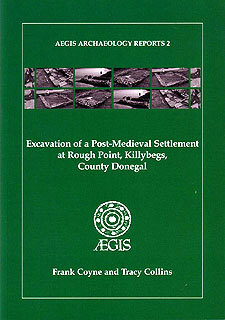 This is the second in a series of Aegis Archaeology Reports, The Excavation of a Post-Medieval Settlement at Rough Point, Killybegs, County Donegal, (published 2004), details the excavations necessitated by the development of Killybegs harbour, involving the construction of a new quay, and the reclamation of 28 acres from the sea. Aegis Archaeology Limited in association with Architectural Conservation Professionals and Ruth Minogue and Associates has produced the Limerick City Walls Conservation and Management Plan in May 2008. This project was funded by The Heritage Council, through its Irish Walled Towns Network (IWTN) and Limerick City Council. The Limerick City Walls date to the thirteenth century and are of national and international importance. A primary aim of the Plan is the continued conservation and management of those stretches that survive. The Plan includes strategic objectives, conservation and management policies to achieve this aim. 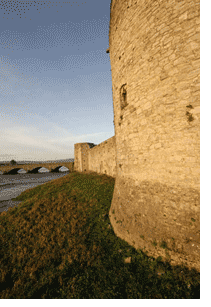 The Plan will be implemented by Limerick City Council through its dedicated Limerick City Walls Committee. Irish Post Medieval Archaeology Group’s next conference will be held 8-10 February at the Enniskillen Hotel, Co. Fermanagh. This year's theme is Borders and Boundaries. Aegis Archaeology is an annual sponsor of this event.